AS an architect, Colin Hopkins aims to create spaces of quiet stillness. As a pianist, he carries this meditative mood into these seven original compositions and four interpretations. Anyone who has heard Hopkins perform — often intent and hunched over the keys, possibly with the acclaimed trio Paper Hat — knows how grand a sound he can conjure from each note. Still explores the richness of solo piano by note and pause. Hopkins celebrates simplicity, clarity and melody, echoing folk themes in Black is the Colour, Chim Chim Cher-ee and his Kali. A slow version of Coltrane’s Giant Steps is dramatic, almost classical. Rain is gently relentless. Most likely to sustain interest are the heavier, brooding Intervention and deeper, sonorous Heartbeat, with its dramatic cascading notes. If this is Hopkins’ architecture, I’d like him to build me a space. 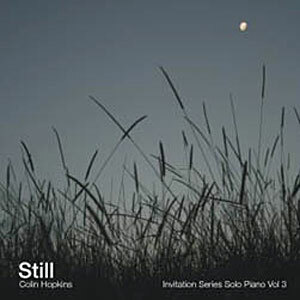 In short: Good reason to buy a piano and Colin Hopkins with it. This entry was posted in CD REVIEWS and tagged Colin Hopkins, Coltrane, Giant Steps. Bookmark the permalink.